July 26, 1916 Spottswood William Robinson III, educator, civil rights attorney, and judge, was born in Richmond, Virginia. Robinson earned his undergraduate degree from Virginia Union University in 1936 and in 1939 he received his law degree from Howard University, graduating first in his class and achieving the highest scholastic average in the history of the university. From 1939 to 1947, Robinson was on the faculty of Howard’s School of Law and from 1948 to 1960 he worked with the NAACP Legal Defense and Education Fund. 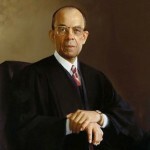 In 1951, Robinson litigated the lawsuit, Davis v. County School Board of Prince Edward County, which was one of the cases consolidated and decided under Brown v. Board of Education in 1954. From 1960 to 1964, Robinson was Dean of the Howard University School of Law. In 1964, he became the first African American appointed to the United States District Court for the District of Columbia. In 1966, he became the first African American appointed to the U. S. Court of Appeals for the District of Columbia Circuit and in 1981 he became the first African American to serve as Chief Judge of the District of Columbia Circuit Court. Robinson took senior status in 1989 and died on October 11, 1998.